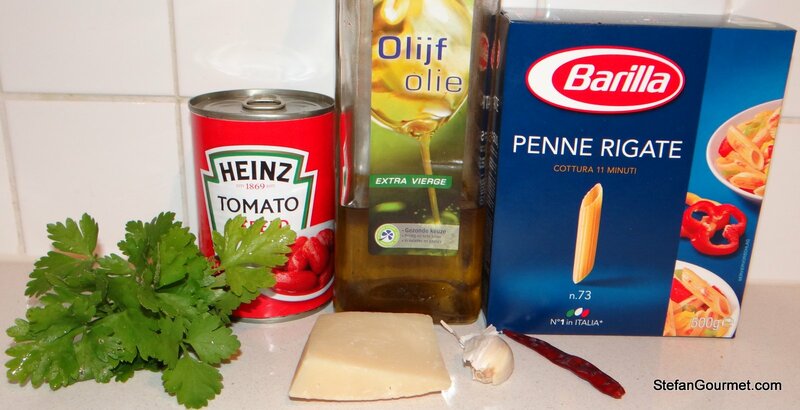 When I did a riff on a combination of Sugo alla Napoletana and Penne all’Arrabbiata to meet Richard’s Chilehead Challenge, I realised that I had not blogged about Penne all’Arrabbiata before. 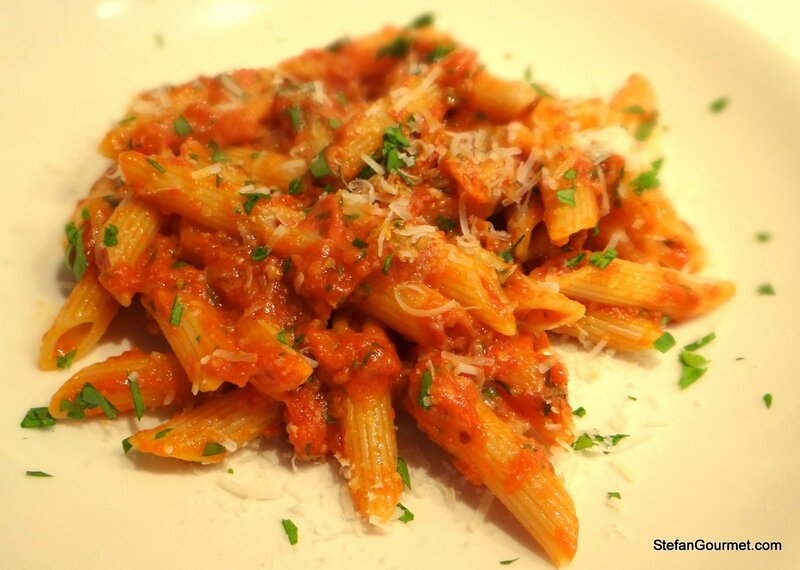 This is a classic dish from Lazio, the region around Rome, of pasta with a spicy tomato sauce. 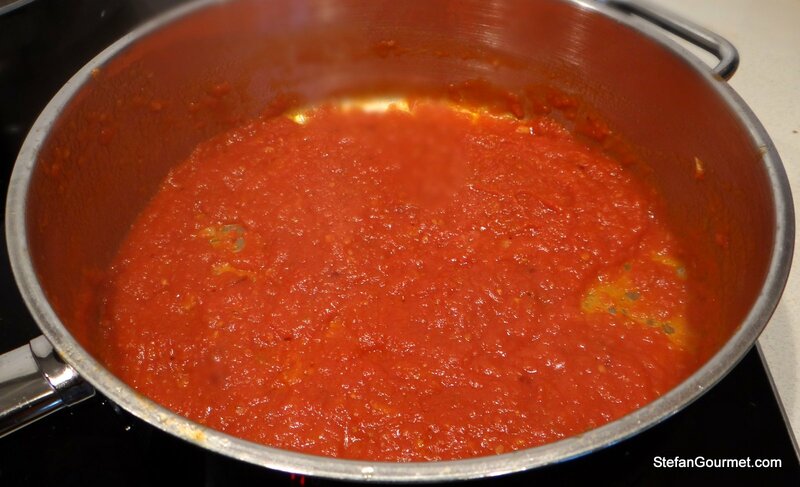 “Arrabbiata” means angry, referring to the spiciness of the sauce. Like all Italian classics, it is a simple dish with a limited number of ingredients, but a lot of flavor. It doesn’t take more time to prepare this than it takes to boil the pasta. Chile peppers are called peperoncini in Italian, which literally means “small peppers”. Peperoni are bell peppers. When not specified otherwise, a peperoncino in Italian cooking means a dried small red chile pepper. The seeds are often removed because you don’t want seeds in the sauce, not because that reduces the heat (because it doesn’t — the heat is in the filaments that hold the seeds). Since this dish is from Lazio, the proper cheese to serve over this is pecorino romano, the sheep’s cheese of the region, rather than parmigiano reggiano. Bring a pot of water to a boil. Add the pasta and salt and cook al dente according to package instructions. Heat the oil in a frying pan. 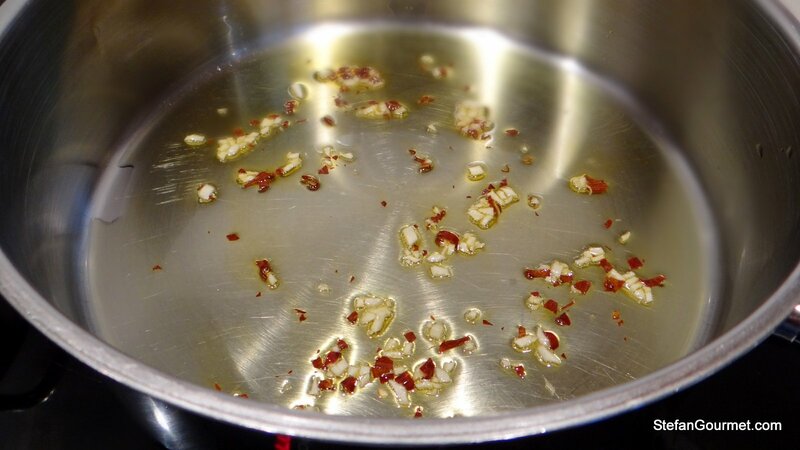 Add the garlic and peperoncino and sauté for a minute. Do not let the garlic burn. 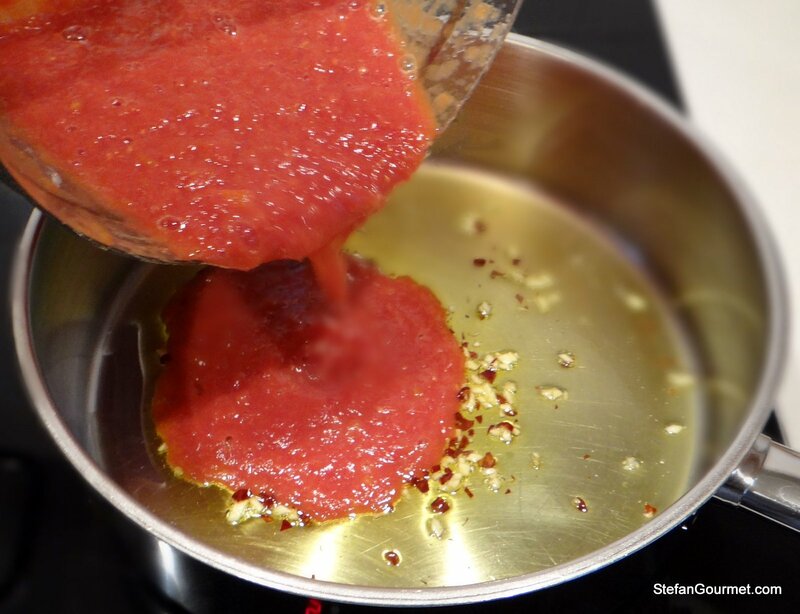 Whiz the tomatoes in the food processor and add them to the oil with garlic and peperoncino. 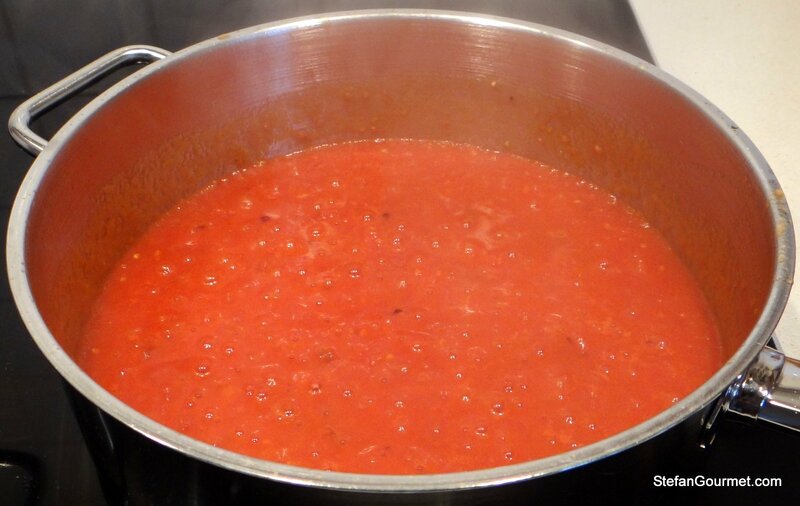 Bring to a boil over high heat, stirring, then reduce the heat so that the sauce cooks with gentle bubbles. Season with salt. Cook until the sauce has a thick consistency. Taste and adjust the seasoning with salt, taking care that pecorino is also salty. 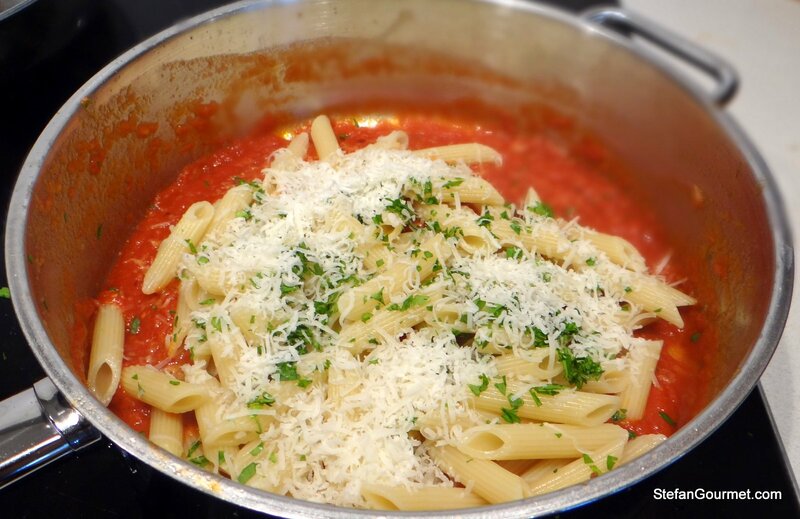 When the pasta is cooked, drain it and add it to the sauce, together with most of the parsley and some freshly grated pecorino. Serve immediately on warm plates, sprinkled with the remaining parsley and some more freshly grated pecorino. This pairs well with an Italian rosé from sangiovese and/or montepulciano grapes. 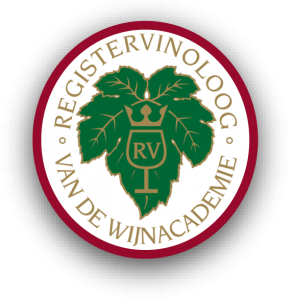 The tomato sauce goes well with reds with good acidity, but the spiciness of the peperoncino works better with rosé rather than a tannic red. One of my favorite quick dishes! Just “pinned” it – looks delicious – and, mostly important for me – easy and quick !! 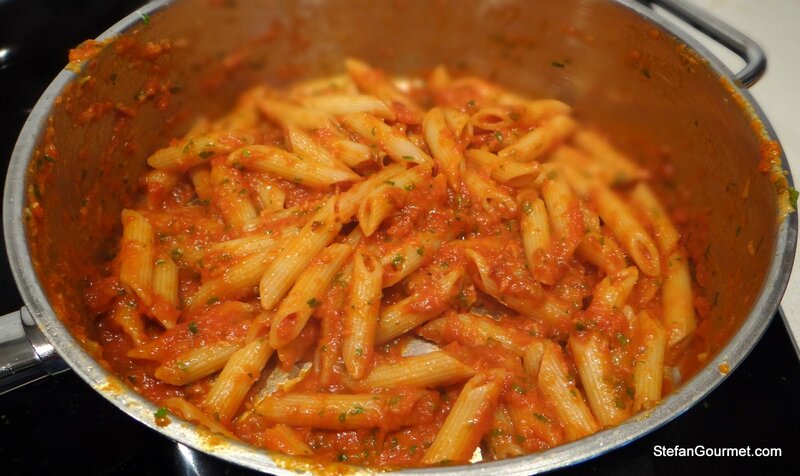 one of my favorite pasta dishes and i have never made it at home. Thanks for this nice post about Stefan! it looks yummy! This was probably the first dish I learnt to cook when I came to Italy. As always it is very authentic. If you like you can add a little fried pancetta. Keep up the good work. Thanks! With pancetta (or guanciale) it would become Amatriciana, right? One of my favourite pasta dishes, boih because it is so fast and easy but also relatively less ‘sinful’ than many 🙂 ! Have learned quite a bit: did always think that the seeds provided the main ‘heat’ in chillis and also would not have thought to differentiate twixt the cheeses! Thank you!!! Another Italian classic Stefan. Very well done. excellent and authentic. awesome job, Stefan! Great post, Stefan. This is one of my favorite pasta dishes. 🙂 Beautifully done.